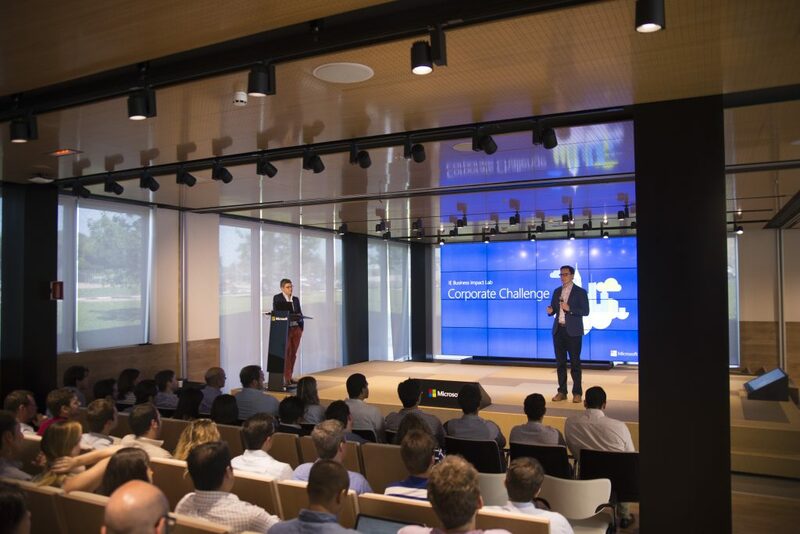 On Monday, June 26, Microsoft Ibérica hosted this year’s Corporate Challenge kickoff, where International MBA students at IE Business School learned about the company they’ll be working with over their 5-week Business Impact Lab. Each year, a different multinational company is selected for the Corporate Challenge. This year, Microsoft agreed to partner with the program, and students will be doing fieldwork related to cloud computing. The event included talks from Microsoft executives, presentations from the program directors, and advice from IMBA alumni. The dean was followed by Lyhe Rotem Ganani, Associate Director of the IMBA, who gave students a warm welcome and explained the program structure. The lab is composed of several modules, including fieldwork (which will take place at Microsoft), mentoring, and a course on design thinking. Next came a string of speakers from Microsoft who discussed the company’s past, present, and future, and gave a brief overview of cloud computing. Tiago Monteiro, Executive Services Director at Microsoft Spain, and Angel Sáenz, Platform, Development, & Innovation Director at Microsoft Spain, were first to take the stage. Microsoft began in 1975 when Bill Gates was on a mission to “put a computer on every desk and in every home.” Today, as Tiago and Angel explained, the company aims to reinvent productivity and business processes, make every individual achieve more, and build an intelligent cloud platform. “Our industry does not respect tradition. It only respects innovation.” These words, from Microsoft CEO Satya Nadella, explain why there are now over 500 million Windows 10 devices active monthly. According to the presenters, Microsoft uses a growth mindset to develop leaders, and their values include social inclusion, diversity, and an obsession with customer satisfaction. Next up was José Bonnin, Cloud & Enterprise Business Group Director, who explained the nuts and bolts of cloud computing, a taste of what’s to come for students in the lab. He broke it down into three main types of cloud: Infrastructure as a Service (IaaS), Platform as a Service (PaaS), and Software as a Service (SaaS). Bonnin then discussed Microsoft Azure’s biggest competitors in the cloud industry: Amazon Web Services, Google Cloud, and IBM SoftLayer. He assured the audience, however, that Azure will defeat its competition with the elements that set it apart: its security and its hybrid cloud platform. He ended by reiterating the relevance of cloud technology. “By 2020, a corporate ‘no-cloud’ policy will be as rare as a ‘no-Internet’ policy is today,” he affirmed. 82 percent of enterprises already have a multi-cloud strategy, and that number is only increasing, so this field is more crucial than ever. After a five-minute break, Azure and Hybrid Cloud Product Manager Diego Gómez continued the discussion, explaining that “the cloud is not a place, it’s a model.” He spoke about coding and Azure Stack, Microsoft’s new hybrid cloud system. He also gave students insight on Microsoft’s current focuses: customer trust, app innovation, hybrid datacenters, and data-driven intelligence. Students in the Business Impact Lab are split up into four teams, each representing a distinct market segment: 1) start-ups and accelerators, 2) independent software vendors (ISVs), 3) digital small and medium businesses (SMBs), and 4) spin-offs. Leaders from each team presented an overview of the project and the topics they’ll be covering, from IoT to big data, modern marketing, and cognitive services. The last to present before the closing remarks and cocktail hour were two alumni who had previously participated in the lab, John and Carin Mazaira. John reminded students that life does exist outside your assigned section, and that this lab allows you to have a social life, despite the program’s rigor. He urged students to take advantage of the social events the school puts on, like the virtual reality zombie game and the speed dating event. Carin’s advice was to embrace the unknown, keep your solution simple, and ask lots of questions along the way. The Business Impact Lab embraces IE Business School’s core values, allowing students to develop innovative and cross-disciplinary management skills so that they can create real impact from day one in any organization they join post-MBA. Students in the lab acquire the tools they need to question the status quo and implement transformational ideas in a corporate setting. In addition to the school’s ranking and international environment, Taub also appreciates how unique its programs are. She sees IE Business School as “a school for quirky people,” an effortless blend of business and liberal arts. To learn more about the IMBA, visit the program website.